Today's guest, Katrina Hamel from Jump in the Way with Katrina D Hamel, reminds us to be grateful for the people we have in our lives. It's also a challenge for us to be the helping hand that someone needs. When we are so busy being mom, raising little ones, giving of ourselves daily, how do we fit in our own spiritual needs? For a long time I felt like I was practically cut off from the church body. My Sunday mornings were spent sitting in the nursery, or trying to hear the sermon from the hallway. It just wasn't the same. Thankfully, someone saw my need and threw me a lifeline. That someone was my dad. With his help, I grew deeper in my faith than ever before. I have three sisters, and all of us were raised with nightly Bible stories and action songs while we jumped around in our pjs. As we grew older, we had family Bible time around the kitchen table. We prayed together, sang hymns, even shared the Lord's Supper as a family. My dad was the one who baptized me in the little pool at the church when I was twelve. My parents are the greatest spiritual influence I ever had, far beyond any preacher, youth pastor, camp counsellor or friend. I know now the utter blessing of having Christian parents, and for them I am truly thankful. Now, I am a mom of four: three sons and my youngest, a daughter. My daughter is very determined. She made up her mind somewhere along the line that mommy, and only mommy, could hold her during church. She loved to go to the nursery, as long as I was there too. I did enjoy visiting with the nursery volunteers and other moms, but I really wanted to be in the service. So, how did my dad, my spiritual mentor, help me out when I couldn't plug into church the way I longed for? He showed me that there are many ways to be a church family, especially now in this modern age. He, at that time, was an evangelist of a small church. He was leading the class through an in-depth study of the Gospel of Matthew, and invited me and my sister (who lives several hours away from me, and also has little ones) to join, via emails. We were given the same homework as those who attended in person, but our discussions, questions, and insights flew back and forth through that bridge that is the internet. I studied during nap times, or early mornings, or late at night. There were days where every time I turned around there was another email with a challenging thought, question, or answer. On those days, I felt like I spent the whole day studying, even though I was caring for kids and the house! That study of Matthew not only fed my yearning for belonging to a group of like-minded believers, but it also changed the course of my life. Motherhood, work, and life had kept me so busy, I hadn't written anything creative in years. This assignment, a short story, was dipping my toes back into the creative pool. I chose to write about John's beheading, but from Herod's perspective. My dad loved it so much he did the “proud dad thing” and shared it with a friend of his, Gary Collier, who is himself an author of several books, and who leads the Institute for the Art of Biblical Conversation. Gary Collier asked if I would be interested in writing a full length novel for his small publishing company. Would I? My head was in the clouds for days, idea tumbling over idea, buzzing with excitement that I might finally have a “real” book on a store shelf someday. Though the prospect of being a real author was incredibly exciting, I was also buoyed up by the idea that my writing could actually be used for God. I've never been really sure of what my “gift” was, what God gave me to help others. Perhaps this was it! That study group, and the sharing of my short story, led me to create a novel based on the Gospel of Matthew, set to be published spring of 2019. I wrote the book in about a year, typing away late into the night after the children were in bed. I had just completed an in-depth study of Matthew, and I dove right back into it again, gleaning more from the book than I ever have before. If anyone is blessed by my novel, I am blessed a hundred times more, because of how much I learned and absorbed and fed my soul by study. I had dark times in my writing journey too. I'm not good enough for this! How can I, a mom who never went to Bible College, try to bring flavor and mood and emotion to people like Peter, the sons of Zebedee, and (gulp!) Jesus. Thankfully, I had all the support I needed. My dad encouraged me every step of the way. He believed in the book, and the good it could do in the world. He helped me sort through theological questions, and was one of the first to read my completed draft. Having people to bounce ideas off of was a necessity for me, for if studying alone was lonely, writing alone was just as bad! It was the prayers and encouragement of my husband, my sisters, and my parents that gave me the courage to get that book on paper! When my husband read my completed third draft and said he was so proud of what his wife had created, it made my heart full to bursting. Perhaps, when the book hits shelves, it will be an utter flop. Maybe no one will like it. You know what? I would write it again in a heartbeat, because how it changed me. How it made me grow! Writing took me on an incredible journey where I was walking along side with Jesus as a disciple. It's a trip I wouldn't change for anything! I hope my story encourages you to think of the people in your life who strengthened, encouraged and continue to raise you up in your faith. Drop them a line, give them a call, tell them how thankful you are for them in your life. I pray that you who are parents, will never underestimate the important role of your teaching, example and encouragement for your children. If you didn't have that encouragement from your own family, start it now, with your own kids. We weren't meant to do faith alone. Katrina is a believer of Christ, a wife of sixteen years, a mother to four, a full time childcare provider, and in her spare time she turns coffee into words. 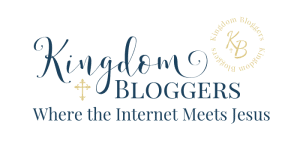 On her blog she loves to retell Bible stories, and hopes they encourage others to Jump in the Way. Watch for her first novel coming spring of 2019. Connect with Katrina on her blog, Pinterest, or Facebook.